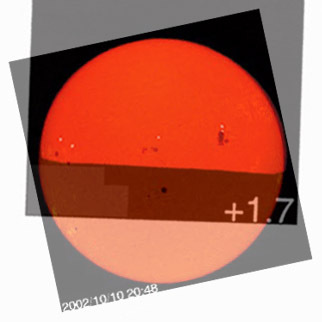 Left, two merged pictures of the sun were taken October 10, 2002, in Resolute and in space by the SOHO solar observatory satellite. They were taken 5 minutes apart in time. 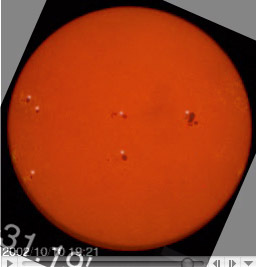 The white dots are sun spots from the Resolute picture, SOHO sunspots were kept dark, the sun was 8.5 degrees above the horizon. To the right, three hours twenty minutes later, in Resolute, the sun was setting behind a hill at 1.7 degrees elevation. Sunspots from the Resolute picture show enormous gains upwards caused by strong refraction (the merged SOHO in space picture was taken 30 minutes later). These gains were previously unknown in the world of atmospheric physics. By doing a worldwide refraction research program while using many features found in sunrises and sunsets everywhere, the Global Warming question would be resolved for the benifit of all. But we must get started soon! For more pictures like these, go to the differential refraction page. This segment is part of a series of pages which should be read as a whole, please read from the main page onwards for a complete breakdown. In the Arctic, the line is caused by extremely strong refraction giving the suns diminished appearance, there are two basic sun line versions, one caused by mirages, with light trapped in thermal inversion ducts, the other caused by very dense air, both types require cold air. The line can equally be translated in terms of brightness. For instance, observing the sun while it is 2 degrees below the horizon ultimately means that sunlight is carried a staggering 120 miles further North. Taking Gerrit DeVeers 1597 observations as factual, and there is no reason to believe them otherwise, means sunlight traveled an incredible 300 Nautical miles further North. This of course is visible from space. Satellite pictures in the visual range, would show without mistake, light being carried North much further than if the temperatures were milder. March 16, 2001 North Pole sequences. The pictures consist of NOAA visual Satellite shots previously displayed on the Internet. The sequence 2 demonstration only shows without a doubt, that there is a great deal of light at the North Pole on March 16, 2001. This in itself is news, since North Pole sunrise should theoretically be at the equinoxe, March 21, but the most important aspect of this light is that it varies, as it should with respect to the temperature of the air masses further South. On these sequences, light is in fact carried beyond the Pole, onwards towards the dark side of the Earth. Warning: The following GIF sequences are huge, 1.9 megabytes each. Sequence 1; A normal sequence. This GIF file shows the pictures as seen on the Internet. Note the elegant sun footprint moving around the pole. Sequence 2; The pictures were altered, levels in contrast and brightness were changed to demonstrate true darkness, and subsequent grey zones. It is known, that the 2nd grey zone away from true darkness is bright enough to land airplanes on the ice, there is sufficient light contrast resolution there to permit a safe landing. The first grey  zone brightness is unknown. Observe the sequence carefully and note the shifting grey zones with respect to the North Pole. Clouds reduce refracted light, concurrently, in fact look carefully at the 16 0005 UTC sequence and see that the grey zones were extremely cut off at the pole. Conversely the greyzones on 16 1201 UTC have much longer shadow zones towards the dark side of the Earth. Ultimately, the coldest weather was most likely on the Alaska, Siberia sector. 16 2105 UTC capture clearly exhibits this, there was a cold high pressure system at the Meridian representing this time. The onset of strong Arctic Haze, a concern for some critics of this method, really happened two or three weeks later. Over the entire multi-national Polar orbiting weather satellite program, all pictures, (countless numbers), should be properly and systematically inter-compared in order to find the true location of the Earth's Terminator, this will show whether light was carried much more Northwards beyond the Pole, as colder air would. When Global Warming greenhouse gases take effect, a dramatic shift southwards of the Terminator line should be noted indicating a gradual but consistent warming to the planet. For now, until a systematic satellite search is engaged, you can note for yourself the gradual warming of your atmosphere by carefully noting accurate sunrise and sunset times. This will provide invaluable information about the state of warming of our planet, something meteorological stations having an horizon will hopefully be doing some day. Mean time, consider intercomparing identical day sunrise or sunsets from one year to the next and see for yourself that there is a shift towards longer dark days as cold air gradually vanishes.